Life in the twenty-first century is comprised of millions of transactions and messages shared each day. These transactions are led by many individuals with unique agendas, with little to no external management. Yet, they typically complete tasks and arrive at their destinations without major problems or confusion. This is due to the detailed processes implemented in our every-day lives. Think about traveling by plane or car. Consider a grocery or retail shopping experience. What about the last time you visited the hospital or the post office? How useful were the signage, visual cues, and written direction when navigating to your final destination? 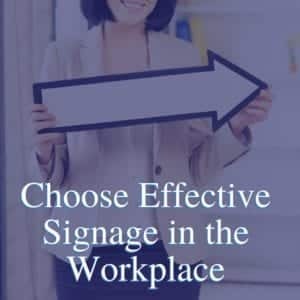 Visual workplace signs are used to offer solutions, explain processes, display important information, organize space, give directions, generate discussion, share messages, prompt action, answer questions, and more. All of this leads to more productive workers. The lean environment concept implements the idea of an organized, visual and process-oriented space that supports management’s goals to improve production methods in order to improve profit margins and become more competitive in the marketplace. The goal of the lean environment concept is to drive costs out of the manufacturing processes and improve the safety of the work environment and worker productivity. The use of signage is one of the tools at managements disposal to visually communicate and give direction daily to plant personnel allowing them to be more efficient in their work efforts. Signage has the ability to eliminate unnecessary wasted time by filling information deficits. It also makes processes safer and simpler, as well as more standardized, logical, fluid and cost-effective. Using signage in the workplace to assist with macro and micro activity is called workplace visuality. The goals of a visual workplace are a self-ordering, self-explaining, self-regulating and self-improving work environment. Signage answers the who, what, when, where, why, how, and what next questions, for both staff and customers. This includes technical information, procedures, steps, visual aids, directions and more. One way to decide what signage would be effective in your workplace is to consider common questions, mistakes, and reasons for wasted time. This may include questions asked more than once in the same time period, or tasks that result in searching, wandering, guessing, checking and re-checking, interrupting, waiting, testing and more. Questions get asked and productivity is halted when vital information is missing. Consider sharing the most important information on sign systems and productivity will likely increase as questions and unnecessary actions decrease. Signage is more than shared messages that benefit the staff and managers. It also creates an environment that people enjoy. Signage helps foster a clean and organized work environment, create logical work or traffic flow, creates safe and informed processes and answers core questions. This all leads to increased productivity and improved profit margins. When using signs to remove as much time as possible from all processes, a value is added to the organization and the visual lean concept is implemented. 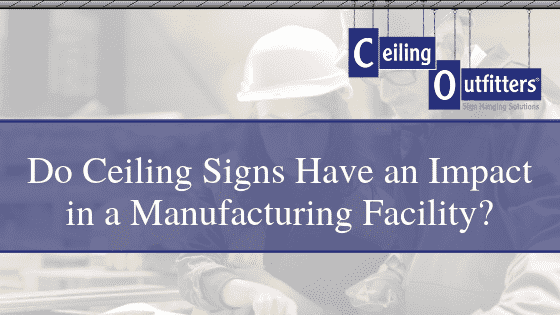 Unfortunately, hanging and changing signs as often as the lean environment calls for appears to be a tedious, difficult, and unsafe process. But, it doesn’t have to be! 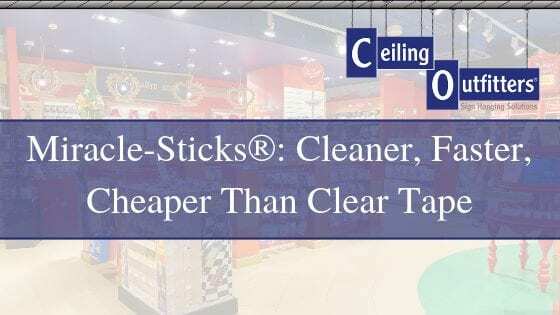 Ceiling Outfitters offers solutions to hang, change and remove signs without ever having to use a ladder or lift reaching ceilings up to 27 ft. high. This makes the process simpler and easier, aligning with the lean environment concept. The Clik-Clik System, complete with strong ceiling magnets, installation poles, and a replacement for steel cable, LoopLine™, is a sign system that provides an easy method to quickly hang, replace, move or remove signs without difficulty and wasted actions, realizing time savings of up to 70%. And, all the components are reusable. Effective signage supports greater productivity and management efforts to create a lean environment that improves production rates, product quality, and increased sales. Why Use Our Essentials Banner Hanging Kit?